Sorvestes Costeira is a traditional ice cream parlour in Florianópolis, with a 30-year history. With only one shop in Costeira neighbourhood, it became a successful brand over time. New points of sale were implemented over the city. However, their line of products didn´t have a proper identity to match the company´s growth. It was necessary to create their own packages to reinforce identity. 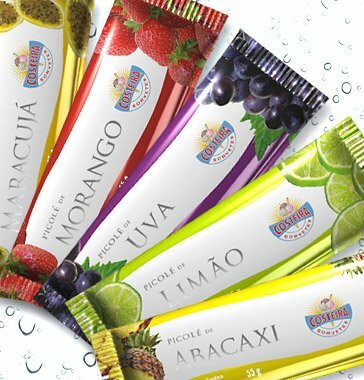 That´s how we started popsicle package design for Sorvetes Costeira. We opted for a clean proposal using appetizing and refreshing images to stimulate consumers desire. We created packages with balanced design elements. Colors, product images and lettering fonts all work harmoniously to create a simple, beautiful and distinctive brand image. Packages were printed in the flexographic process in metalized BOPP, 4 colors. As a result, the company expanded its sales area, obtaining even more points of sale. Some more popsicle cases here.